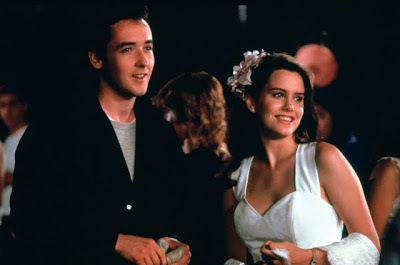 In a scene that has transcended Say Anything... to rank as the most iconic pop culture image of Cameron Crowe's entire career so far, John Cusack's brokenhearted optimist Lloyd Dobler blasts a Peter Gabriel song overhead from a Boombox in his own version of the Romeo and Juliet balcony encounter while trying to win back the heart of Ione Skye's Diane Court. Yet, the sheer vulnerability, humor, confidence, lack of cynicism, sensitive male passion and emotional nakedness of that very scene can likewise be viewed as the quickest visual way to summarize both the man behind the camera and the films of Cameron Crowe as well. Just as you can recognize a Cameron Crowe film as soon as you hear the honest rush of free-flowing, unpretentious dialogue in the uninhibited exchanges of Say Anything..., Jerry Maguire, Almost Famous and Elizabethtown, Crowe's fingerprints as a former precocious teen journalist turned filmmaker are just as identifiable for the humanistic richness of warmhearted feelings he's able to deliver to viewers. Cameron Crowe's sequences frequently walk the tightrope of pleasure and pain or humor and heartache and can move from one end of the spectrum to the other in the amount of time it takes a single tear to trickle down Kate Hudson's cheek before she brushes it away, forms a smile, and tries to joke away her disappointment in Almost Famous. When referencing what led up to the first screenplay he'd written in which he would also direct more than twenty years ago, Crowe stated that wanted to make emotionally true movies "from deep down inside." And sure enough, that's something he's managed to achieve repeatedly, yet this goal takes its purest form in his straightforward, tender and refreshingly simplistic directorial debut which has been re-released last month from 20th Century Fox for its twentieth anniversary. Although Crowe's films often share a nostalgia for the same blend in the works of his idols such as Billy Wilder and are legendary for their use of a tremendous soundtrack (as some critics have claimed to an extreme extent in Vanilla Sky), the most enviable repetition in his works is that they all center on extraordinarily three-dimensional ensemble casts of characters populated by individuals you feel as thought you either know or could theoretically meet walking down the street. There's nothing false about the personality of a Crowe character, even when they're yelling "show me the money" in desperation to hang onto a job that they felt was the entire basis of who they were as a human being. And while he's particularly gifted at writing the type of female roles he calls "golden girls," the tough masculine posture of male characters who are just as vulnerable (if not more so) than the female characters are his unmistakable trademark. Honest, passionate, and driven-- even if it is to something as improbable as a kickboxing career or simply loving Diane Court in Say Anything...-- Crowe's work is filled with people who give their heart to a consumerist society that as evidenced in Anything sometimes gives them a pen in return. However and much to our delight, Crowe's creations continue to stay optimistic whether they're dreaming of moving to Spain with Penny Lane or holding that Boombox over their heads one more time. Crowe is also an auteur who has always followed that old adage to "write what you know," whether it's in his mostly autobiographical masterwork of Famous, or Elizabethtown which was inspired by his father. However, the same filmmaker who once said that "mannerisms inform character," has also created a few of contemporary cinema's greatest characters simply by encountering them. When a man wiped his face on a plane, it became Jerry Maguire, and the most literal example of meeting the people who ended up on the page is found in this film when a new neighbor showed up at his door, wiped his hand on the side of his pants before shaking Crowe's formally, and introduced himself as Lowell, a wannabe kickboxer passionate about "the sport of the future." Despite the fact that he admitted to James L. Brooks that Lowell annoyed him a great deal with frequent visits, the young man had an inspirational effect on the similarly young Crowe. And once Brooks told him to "write that guy," something clicked and he managed to pull from both Lowell the kickboxer and the idea of a man voluntarily going on a hopeless journey towards possible heartache to pursue the heart of the school's golden girl. While the character of Lloyd Dobler feels like a close relative of other Crowe characters and also seems to recall Crowe as well, watching it again this time, you get the sense that Crowe drew an awful lot from his own circumstances essentially missing out on traditional teen activities and having no sense of regular social interactions in high school when he penned what is still the best role that actress Ione Skye has ever been given. 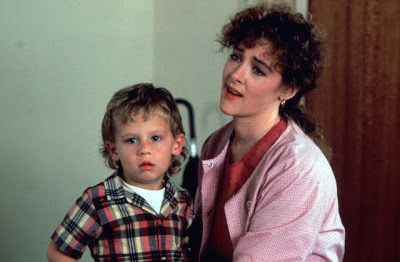 A movie that's been written about and viewed so many times that to dissect it now would be superfluous, Anything is a marvel on a number of levels when you realize just how fully realized every character in the film is from John Mahoney's pitch-perfect turn as Diane's dad who takes the smallest of moments like trying to flirt with a woman at a furniture shop before his credit card is declined to the way that Joan Cusack knows how to bring her brother to another level playing his sister. Yet the most striking aspect of Anything is how fresh it still manages to feel so many years later. 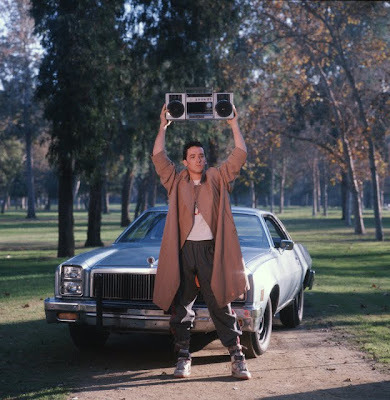 While parents and children, the idea that opposites attract, teen love, and the outsider feel of being the brain have never gone away, Say Anything... still resonates more than other '89 works because it's so emotionally true, so rooted in the very personality of its creator in a way that we just don't see in cinema much anymore. The characters and the various extras on this new DVD edition can of course "say anything" given the fact that all exist in a society of free speech. Still it's important to remember that what they say wouldn't mean anything without the real heart behind it, the drive to reach "deep down inside," the willingness "to get hurt," and put everything on the line with a song on a Boombox. All of these ingredients ensure that the movies of Crowe will never age since there's no expiration date for honesty, real people, and the attempt to connect with another human being... whether it's the smart girl in school, your neighbor the kickboxer, or the audience that has been reveling in Crowe's work for more than twenty years. FTC Disclosure: I gave this film my heart nearly two decades ago and never received a pen in return. While 20th Century Fox did provide me with this DVD anniversary edition to review as I'd previously owned it myself on this outdated medium called VHS, it had no bearing on my willingness to Say Anything... in my review about Cameron Crowe's directorial debut.